Much awaited news for foodies and food connoisseurs, the third edition of the Michelin Guide Seoul has been released. 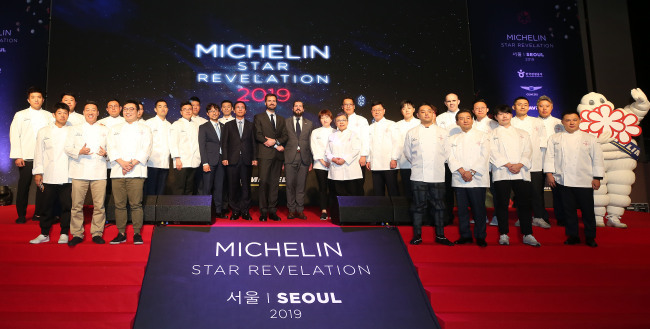 “With these new star establishments, Seoul, which already had two three-star restaurants, is making an impressive leap into the world gastronomic scene,” Gwendal Poullennec, international director of the Michelin Guides, said prior to revealing the list. Fine dining Korean restaurants Gaon and La Yeon kept their three Michelin stars in the new edition. The two high-end restaurants have maintained their spot at three stars since the guide was first published in Seoul in 2016. Two new restaurants -- contemporary dining restaurant Mingles and Italian eatery Alla Prima, which moved up a rank from last year’s single Michelin star -- joined the list of two-star restaurants. Kwon Sook-soo, Jungsik and Kojima kept their two-star status from last year. Five new one-star restaurants have been added: Mosu, Muoki, Hansikgonggan, Lee Jong Kuk 104 and Stay. Seoul now has 19 one-star restaurants. Chef Ahn Seong-jae, who led trendy restaurant Mosu in San Francisco, has continued with his unique culinary style in Korea. Stay, situated on the 81st floor of Signiel Seoul, is led by French chef Yannick Alleno, the only non-Asian chef on the list. In addition to the Michelin star restaurants, 61 restaurants made it to the Bib Gourmand list, recognized for serving quality food at a reasonable price under 35,000 won ($30.90). Eleven new restaurants entered the list. Gotgan, on the other hand, lost a star, as it was demoted to the one-star eatery list this year.